Adama Diakhaby served breakfast to over 100 children at one of the Town Foundation’s ‘Early-Kick-Off Breakfast Clubs’ on Thursday 25 October 2018. Adama got up early to surprise students from Thornhill Junior and Infant School as he wanted to witness the excellent work the Town Foundation does in the local community. 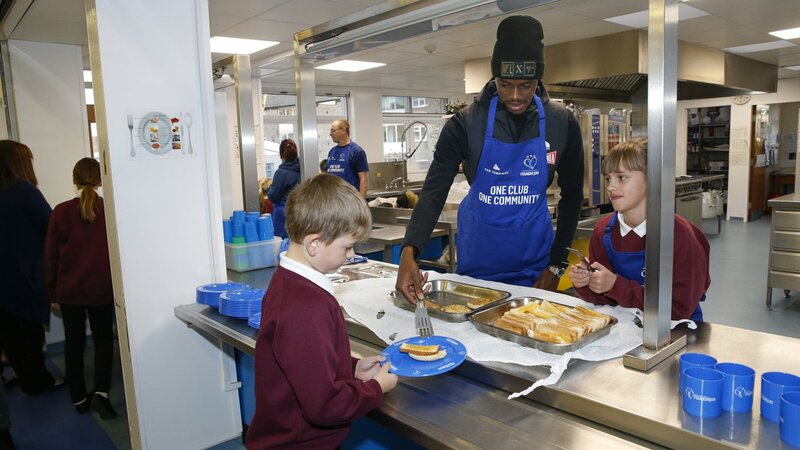 Town’s winger threw himself into the experience, getting involved by putting on a Town Foundation apron and serving the students, before sitting and enjoying breakfast with them. The children thoroughly enjoyed chatting with Adama and were even more excited when he signed some autographs for them. Not only this, the 22-year-old donated one of his match-worn shirts to the school and signed it. “It was fantastic to see Adama make his first visit to one of the Town Foundation’s ‘Early Kick-Off’ Breakfast Clubs. “As a newcomer to the area, Adama was really keen to get to know the community and in particular what the Club does outside putting a team on the pitch every weekend. “He really launched himself into the morning, getting to know the fantastic pupils at Thornhill J&I School from the off.